This is the latest generation 4 axis motion control card. 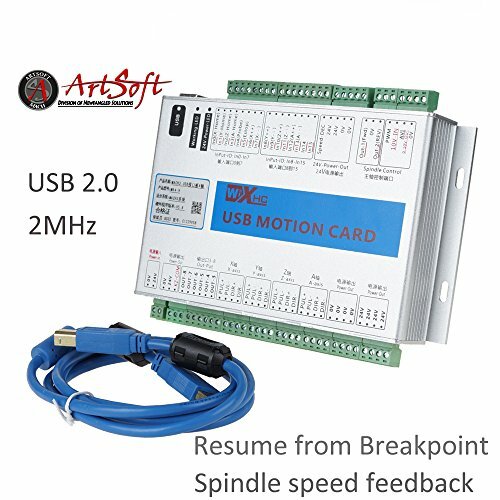 It comes with resume from breakpoint function and spindle speed feedback. Now new version is stronger, more stable and better performance. Support all versions of Mach3. Full support USB hot-swappable, USB connection status monitoring at any time. Under Mach3 working state, USB cable unplugs and then plugs in, the connection would be normal still. Maximum step-pulse frequency is 2000 KHz, can connect servo driver/stepper driver. 16 input port, 8 output port. I/O ports can be expanded. Support XHC series of wireless electronic mach3 MPG, such as WHB04 MPG.